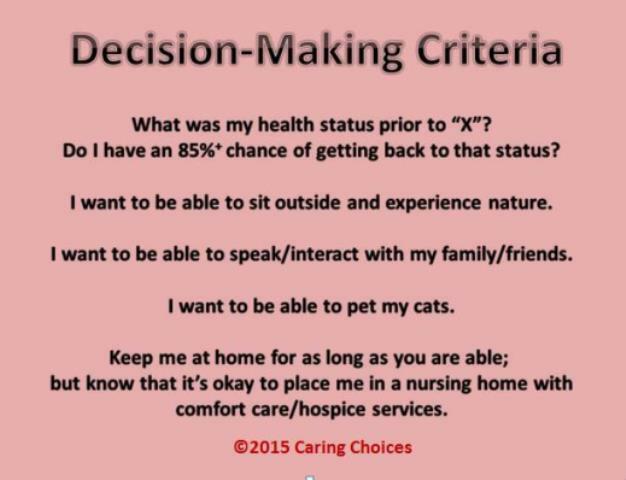 I recently had the opportunity to provide a Caring Choices presentation titled “Decision-Making for a Loved One.” The people in attendance were strong advocates for elder loved ones in fluctuating phases of aging and health. Some are dealing with varying stages of dementia; others are in end stages of chronic illnesses. Still others have recently experienced acute illnesses that thrust their family members into decision-making roles sooner than they anticipated. Since becoming a Certified Dementia Practitioner, I’ve also presented a staff in-service and community seminars on the complex, multi-faceted umbrella of neurocognitive disorders (dementias) that afflict many individuals and their loved ones. I’ve come to really enjoy teaching these sessions and offering educational opportunities to people who are trying to understand the disease process a loved one is going through as well as coming to grips with their role as caregiver or decision-maker. Caring Choices offers education and support to individuals and their families in order to prepare for whatever their future health concerns might be. We’re not solely focused on the “end stage” of diseases, dying process, or the death bed experience. Our goal is to help people have conversations about what’s important to them in every stage of their lives as age advances and health declines. Below is one of the slides I presented which seemed to best illustrate the purpose of the conversations we’re promoting. These are some of the decision-making criteria that are important to me. As we reviewed this slide, I could see the “lightbulb moment” for some of my presentation attendees. They started thinking about their own criteria to help their families make decisions if they’re unable due to an acute crisis or other medical emergency. It’s not always about dying and death … sometimes it’s just about what matters most at a particular moment. Caring Choices is available to provide education to your group as well as personal consulting to individuals/families. Conversations are important in determining your decision-making criteria. The presentations we offer can help you figure that out and help your loved ones have the knowledge and courage to make decisions when they most need it. This entry was posted in Personal Stories, Resources on July 5, 2015 by Cindy Moyer.